Ohio State’s Andre Wesson, left, goes to the basket against Indiana’s Juwan Morgan during the second half of an NCAA college basketball game, Sunday in Bloomington, Ind. The Buckeyes have scored fewer than 70 points in five of their last six games. And they’ll need more scoring punch to survive a tough final stretch and secure an NCAA Tournament bid. The Hoosiers forced 15 turnovers but were 6 of 20 on 3s and got outrebounded 35-29. If those numbers don’t change, Indiana’s struggles will continue. 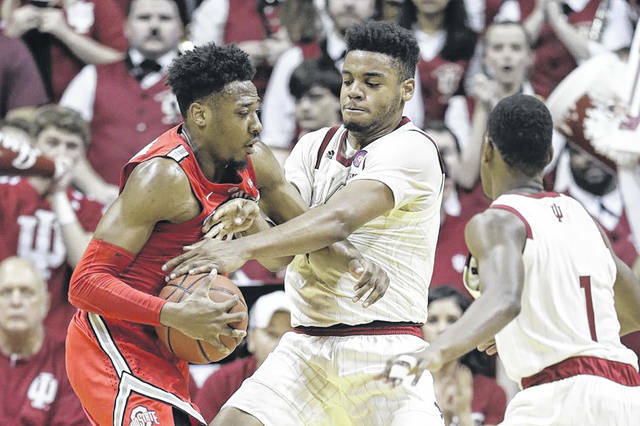 https://www.limaohio.com/wp-content/uploads/sites/54/2019/02/web1_BuckeyesMen.jpgOhio State’s Andre Wesson, left, goes to the basket against Indiana’s Juwan Morgan during the second half of an NCAA college basketball game, Sunday in Bloomington, Ind.